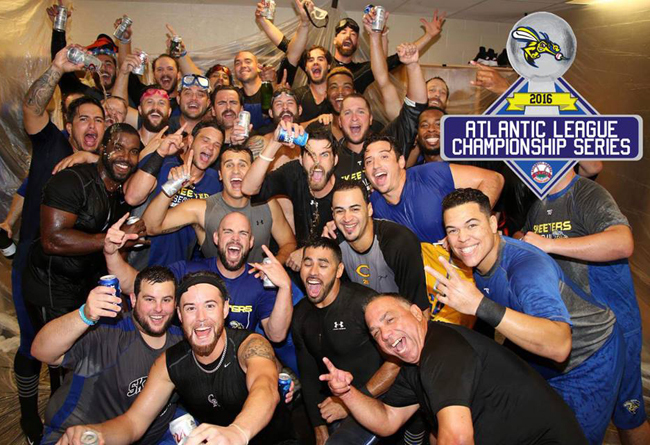 (York, Pa., Sept. 23, 2016) - The Sugar Land Skeeters earned their third consecutive victory over tbe York Revolution on Friday night, advancing them to their second Atlantic League Championship Series in team history. Ryan Mattheus earned his third win and Mike DeMark his first loss. The Skeeters would strike first in the top of the second with a solo shot from Lance Zawadzki, giving the Skeeters an early 1-0 lead over York. However, York would respond in the bottom of the fourth with a two-run shot from Bryan Pounds, bringing Andres Perez across the plate and giving York a 2-1 lead over the Skeeters going into the fifth. Following walks from Juan Martinez and Josh Prince in the top of the fifth, an error by catcher Isaias Tejeda would allow Martinez to advance to third. Rene Tosoni would then reach first on a fielder’s choice, bringing Martinez across the plate to tie the game up 2-2. The Skeeters would then surge ahead in the top of the sixth following a two-out grand slam from Prince, giving the Skeeters a 6-2 lead over York. However, York would promptly cut the Skeeters’ lead to two runs with a two-run shot from Kevin Rivers in the bottom of the sixth. The Skeeters would maintain a 6-4 lead until the bottom of the ninth, with Joel Guzman’s bases-loaded single to left field would score Michael Rockett and Josh Wilson, tying the game 6-6 and forcing extra innings. The top of the tenth would bring in two more runs for the Skeeters, with a bases-loaded walk to Prince scoring Wilfredo Rodriguez and a wild pitch to Tosoni bringing Jeff Dominguez across the plate, giving the Skeeters an 8-6 lead that would ultimately lead to a third consecutive win over York and advancement to the Atlantic League Championship Series. The Skeeters will return home for the first two games of the Atlantic League Championship Series beginning Tuesday, September 27, at 7:05 p.m. at Constellation Field. Purchase your tickets by calling the Skeeters box office at 281-240-4487 or visit www.sugarlandskeeters.com.